There has been a lot of focus on Bitmex’s funding rates and whether the shift is an indication that the bear crypto market may be coming to an end. 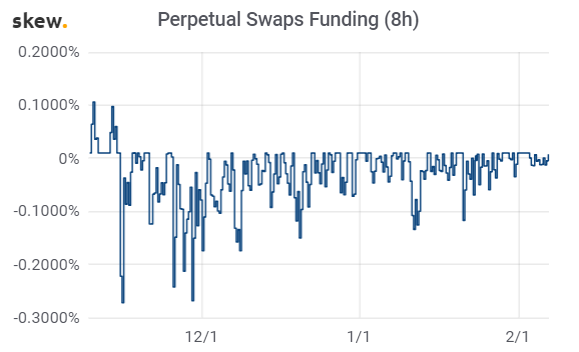 In addition to that, Bitmex futures are also exhibiting a shift in the curve away from deep backwardation, with forwards priced much closer to spot than before. Given the severe crypto market correction over the course of 2018, it may be tempting to see the shift as exactly that: signs of a new bull market. However, there may be other factors at play. First of all, Bitmex exchange was forced to close a number of US and Canadian accounts upon request from regulators. The move resulted in a sharp decline in liquidity on the cryptocurrency exchange, as evidenced in the reduced sum of bid/ask volume around “spot”. Fewer crypto traders means lesser need for market-makers/liquidity providers, and it is more likely than not that some did pull out, resulting in an unwinding of their own trading book. On the subject of the futures curve, while Bitmex futures may be exhibiting a shift away from deep backwardation, the futures on the CME and the CBOE are showing fewer signs of a shift towards contango. As a guide, contango is an upward sloping curve (where the futures price is above the expected future spot price). In real life example, this is usually linked to storage costs. In the world of digital assets, the shift towards contango may be linked to heightened fears of hacking, credit risk associated with an exchange and more interestingly, loss of private keys and custody solutions. The last point is of particular interest because this implies that current crypto holders, even those that may already have custody solutions, do not necessarily believe the solution will prove effective in the case of a malicious attack. In turn, crypto holders may be prepared to pay a premium for the futures price. Finally, a quick point about borrowing/lending. Cryptocurrency market-makers and risk-takers share few common traits; one such trait is the reliance on healthy money markets. The Federal Reserve kept rates for an extended period of time and the hikes up until 2018 were much more gradual. However, the tone turned much more hawkish in 2018, more hikes followed, and the crypto market (global equities) ended the year on a sour note. While there may be little underlying correlation to various traditional assets, cheap and abundant liquidity is a must for a hedge fund, not only to explore alternative investments but even more so non-traditional ones. At the same time, there may be a reduced demand from funds looking to short assets.